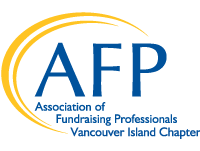 During the mid 1990s a movement developed in Victoria BC to initiate discussions within the fundraising community relative to establishing whether there was any interest in forming a Chapter of the National Society of Fund Raising Executives (NSFRE), a major fundraising association headquartered in the outskirts of Washington DC USA (later to be known as the Association of Fundraising Professionals (AFP)). At that point in time there was only one Chapter of NSFRE in Canada. This Chapter, located in Toronto, had evolved in 1989-90 from the Ontario Chapter of the Canadian Society of Fundraising Executives, a body in no way affiliated with NSFRE. For the complete history click here.